Hipp Organic Spaghetti Bolognese 6mth (125g). We always make sure we select the freshest products available with the longest shelf life and provide it all to you at speed and without fuss. Hipp Organic First Infant Milk 800G (2 Pack). Hipp Organic Growing Up Milk 600G (2 Pack). Hipp Mixed Vegetable Medley (4 ) [125g x 6]. Hipp Apple & Blueberry Dessert (4 ) [125g x 6]. Hipp Baby Food Combiotic Growing Up Milk - Stage 4 From 2 Yrs - NON ORGANIC 600g. Hipp Follow On Milk [800g]. Hipp Banana & Peach Dessert (4 ) [125g x 6] (3 Pack). Hipp Apple & Pear Pudding(4 ) [125g x 6] (6 Pack). Hipp Spaghetti Bolognese (7 ) [190g x 6] (3 Pack). Hipp Organic Apple & Blueberry Dessert 4mth (125g). They are steam cooked to give you delicious baby food bursting with goodness & flavour. Hipp Creamy Porridge (6 ) - Dried [160g x 4] (4 Pack). Hipp Comfort Milk[800g] (4 Pack). Hipp Just Fruit Apple & Pear (4 ) [(100gx4) x 6] (4 Pack). HiPP Organic Apple & Strawberry fruit purees with tiny apple pieces. Hipp Organic Puree & Pieces are simple and delicious purees with tiny apple pieces to encourage chewing. They are also great for toddlers, older children and adults too! Hipp Banana & Peach Dessert (4 ) [125g x 6] (5 Pack). 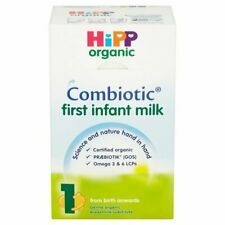 Gentle organic infant milk for hungrier babies from birth onwards Why choose HiPP Organic Combiotic® hungry infant milk?. Supported by 50 years of breastmilk research, HiPP Nutritional Science has created HiPP Organic Combiotic®, the only complete range of organic formula milks in the UK. Hipp | Apple & Pear Pudding (4 ) | 2 x 125g. Hipp Apple & Pear Pudding(4 ) [125g x 6] (4 Pack).